The David Bohnett Cyber Center is a public computer lab located at the LGBT Center of Raleigh. The Cyber Center provides access to the internet, computer software applications, free to low-cost computer skills and career building classes, and one-on-one mentoring. The Cyber Center is staffed with a volunteer lab monitor to answer questions during open hours of operation. 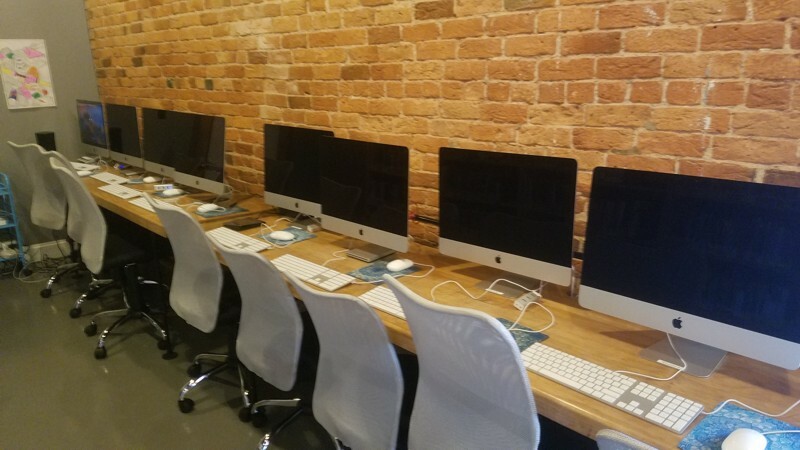 The David Bohnett Cyber Center is to provide access to the Internet, computer software applications, free and low-cost computer skill and career building classes, and mentoring to individuals who may not otherwise have access to such resources. The Cyber Center is a largely volunteer-driven program with a team of volunteers oversee and maintain the lab during hours of operation. Over time, the Cyber Center will evolve with the needs of the Center. In the future, we predict having peer-education for software and online platforms, as well as hosting young people who are home-schooled or finishing their GED. Opened in 2016, The David Bohnett Cyber Center’s primary goal is still paramount: to empower our community to use technology as a tool to increase economic, personal and social well-being. The Cyber Center provides a safe and welcoming space for members of the LGBT community to use one of our 8 computer work stations to access the Internet, process documents, and receive support in navigating today’s technologically-oriented workplace. Many visitors to the Cyber Center have not had the opportunity to learn or use computers before; therefore, volunteers are on hand to assist users during hours of operation. There are few restrictions on information and thus visitors can search through many vital LGBT websites containing information on issues of sexual identity, mental health and community organizing that might be banned at other institutions. And while the parental controls are in place and maintained by the software’s defaults, we will be able to edit those pages that are banned inappropriately. The Cyber Center client computers each have access to Microsoft Office (Word, Excel, PowerPoint, Publisher) and the Internet. One computer will have Adobe Acrobat, Photoshop, and Illustrator. The Cyber Center is open Monday, Wednesday, and Friday from 12:00 pm to 5:00 pm. The hours will change as we see how many people use the space and how the flow works with the rest of the Center. The Cyber Center can also be booked for private events and trainings. Outside organizations, for a small fee, may use this space as well for a myriad of opportunities. Contact James Miller (jmiller@lgbtcenterofraleigh.com) for more information.